Maximum real time solicitations require Quality of Service (QoS) during data communication. Therefore many routing protocols for Mobile Adhoc Network (MANET) associating Real Time Applications have been established that uses improved Real time structure for optimization of delay and energy efficiency, basic objective being great deployment of resource in resource limited environment. Congestion Control is another important issue while directing towards QoS achievement specifically with highly transferable mobile stations. 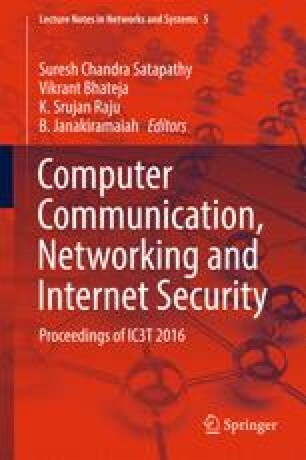 This paper highlights on congestion control issues in real time environment as well as proposes an upgraded traffic shaping mechanism in TCP/IP protocol suite of network model for real time applications with basic concept using the token bucket traffic shaping mechanism during packet routing at the intermediate nodes. Simulation findings illustrates that our proposed method performs better in highly congested traffic scenario with reduced queuing delay and improved packet delivery ratio. Sensor and Ad Hoc Networks, Theoretical and Algorithmic Aspects, Springer, (2008). DOI: 10.1007/978-0-387-77320-9 [Last Accessed – 8th September,2016]. http://www.eecs.yorku.ca [last accessed on 13th Jan, 2016].